Te Anau SUP is a small, family run business led by a couple of SUP afficianados that provides SUP hire and sales, as well as instruction, fitness, community outreach, and SUP based adventures in the Fiordland region of New Zealand. Based in Te Anau, we have local SUP knowledge that will help you enjoy the awesomeness that is stand up paddleboarding whether it's your first time out on the lake or you're up for a multi-day SUP adventure and some real wilderness. Pristine lakes, exciting rivers, and world class surf are all located within a 90 minute drive! For more details on how we can get you on the water, check out the menu links above. We do not have any official office or a store. You can find us often by the lake, however the best way is contacting us via websites, facebook or phone. We hire top of the line Red Paddle brand inflatable paddleboards. In fact, these boards are so good that if we hadn't just told you they were inflatable, you'd probably never have guessed. We have six boards in a variety of sizes to cater to everyone from the biggest to the smallest paddlers out there. Enquire for overnight or multi-day hire rates. Please note that we recommend booking ahead for all half and full day hires, particularly with larger groups, to ensure board availability. Friendship (available now, ongoing): Supping is even better with a friend! Grab one and get two one hour rentals for $40. Then grab a coffee afterwords with the money you saved. Downriver (available now at select times, enquire for details): If you've had some prior SUP experience, maybe it's time to tackle moving water! For $50 per person we'll drop you off at the Control Gates and pick you up at the Rainbow Reach bridge two hours later. In between? 14 km of river awesomeness. Get a group of 2 or more together and we'll even go with you because we love it so much! You're essentially getting a free guide! Group Learning (available now, ongoing): get a group of 4 or more together and rent boards at the friendship rate ($20 for an hour) and get a instruction pro bono. Good option for first time SUPers or those looking to build their skills. 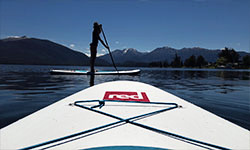 Te Anau SUP is an official retailer of Red Paddle brand SUPs. We offer a try before you buy program for locals which will allow them to use up to $100 of rental credit towards the purchase of their own board. While owning your own board is super fun and highly recommended, we understand that a paddleboard is a big purchase, so come try one of ours out and make sure you know what you're getting. If you do decide to order through Te Anau SUP, we'll also pay for freight to anywhere in our distribution area, which pretty much includes most of Southland (rural delivery charges may apply). While as a retailer we aren't allowed to offer discounts off RRP we're committed to getting as many people enjoying paddleboarding as we can, so we're happy to work with locals on payment plans and offer reduced cost accessories such as paddles, leg ropes, etc. We'll also sell off our fleet of rental boards every couple of years so make sure to like our facebook page if you're keen for a great deal on a used board. We can order from Red Paddles entire fleet. Click here for 2016 pricing.